ST. JOHN, IN--(Marketwired - June 18, 2015) - A leading St. John cosmetic dentist is now offering in-office teeth-whitening treatments that can improve the brightness of patients' teeth by several shades in less than an hour. The new revolutionary whitening solution, Philips Zoom QuickPro, uses a special whitening varnish that takes just five minutes to apply and can brighten a patient’s smile by four shades in about 30 minutes. "This treatment is so simple and quick that I’ve been recommending it to nearly all of my patients during their regular cleaning," said Dr. Scott Kapers, whose Creating Smiles dental offices are located in Valparaiso and St. John. Philips Zoom QuickPro uses a special solution that seals the whitening varnish shortly after it is placed on the patient's teeth. QuickPro is applied with a brush and does not require a mouthpiece. The whitening varnish stays on the patient's teeth for 30 minutes and can be easily removed by brushing. Dr. Kapers, who began offering Philips Zoom QuickPro this month, said the new form of whitening has little to no discomfort because the whitening vanish does not come in contact with the gums. QuickPro whitening also costs less than traditional whitening methods, making it an affordable cosmetic dentistry solution. "This whitening service can be added on to almost any appointment without prior notice," Dr. Kapers said. "It's great for the patient because it takes less time, costs less and does not require a separate appointment." Creating Smiles is a two-office practice that provides comprehensive dental services to children and adult patients. Dr. Kapers focuses on sedation dentistry and implant dentistry. He provides dental implants to stabilize dentures and to replace individual missing teeth. Most of Dr. Kapers’ dedicated staff have been with him for more than 15 years. Dr. Kapers earned his dental degree from Indiana University School of Dentistry. He started Creating Smiles in 1993 and has completed hundreds of hours in continuing education. He offers comprehensive dentistry services, including dental implants and sedation options for fearful patients or those who need multiple dental treatments. Dr. Kapers received training in Botox and dermal fillers from the American Academy of Facial Esthetics and the International Congress of Oral Implantologists for dental implants. Dr. Kapers' associate, Dr. Joseph Ornelas, also earned his dental degree from Indiana University School of Dentistry. Dr. Ornelas, a Crown Point native, received his bachelor of science degree from Purdue University. The Creating Smiles St. John location, 8217 Wicker Ave., is open from Monday through Saturday. The Valparaiso location, 2262 Morthland Drive, is open Monday, Wednesday, Friday and Saturday. To learn more about the price of dental implants at Dr. Kapers’ St. John or Valparaiso dental office, visit the website at www.creatingsmilespc.com. New and current patients also can call the St. John dental office at 219-213-3600 or the Valparaiso office at 219-246-5249. Dr. Scott Kapers earned his dental degree from Indiana University School of Dentistry. 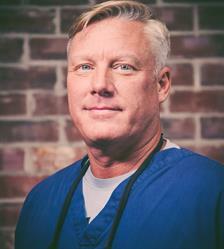 He started Creating Smiles in 1993, and has completed hundreds of hours in continuing education. He offers comprehensive dentistry services, including dental implants and sedation options for fearful patients or those who need multiple dental treatments. Dr. Kapers received training in Botox and dermal fillers from the American Academy of Facial Esthetics and the International Congress of Oral Implantologists for dental implants. Creating Smiles is a two-office practice that provides comprehensive dental services to children and adult patients. Dr. Kapers focuses on sedation dentistry and implant dentistry. He provides dental implants to stabilize dentures and to replace individual missing teeth. Most of Dr. Kapers' dedicated staff have been with him for more than 15 years.